Two days after their daughter is born, Kari Vaara drops a bombshell on his American wife, Kate: He has a brain tumor . . . and he's been handpicked to run a rogue black-ops unit, using crime to fight crime.After recovering from surgery, he gets to work. The black-ops unit is small, and reports directly to Finland's national chief of police. They have secrecy, autonomy, and the cash to buy all the high-tech gear. Soon the unit is cleaning house, robbing Helsinki's mobsters blind of their cash, dope, and illegal firearms. But Kari's team is too good, and their actions have unintended consequences. . . .Meanwhile, Finland roils with hatred as its most extreme right political party gains popularity despite having no agenda besides xenophobia. When the country's leading immigrants' rights advocate is assassinated and her head sent by mail to the Finnish Somalia Network, the president assigns Kari to the murder. Cracking this case will involve the unsolved kidnapping of a billionaire's children, a Faustian bargain with a former French legionnaire-and Kate. "Superbly written and full of insights about Thompson's adopted country . 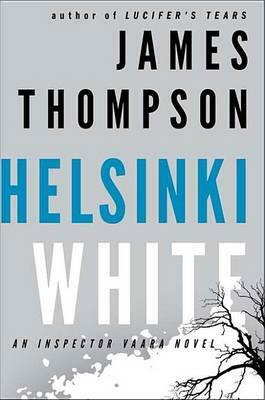 . . ["Helsinki White "is] a first-class crime novel." --Leighton Gage, author of "A Vine in the Blood"
James Thompson, eastern Kentucky born and raised, has lived in Finland for over a dozen years and resides in Helsinki with his wife. His debut novel, "Snow Angels," was selected as a "Booklist "Best Crime Novel Debut of the Year and was nominated for the Edgar, the Anthony, and the Strand Magazine Critics award. Before becoming a full-time writer, Thompson studied Finnish--in which he is fluent--and Swedish, and worked as a bartender, bouncer, construction worker, and soldier.